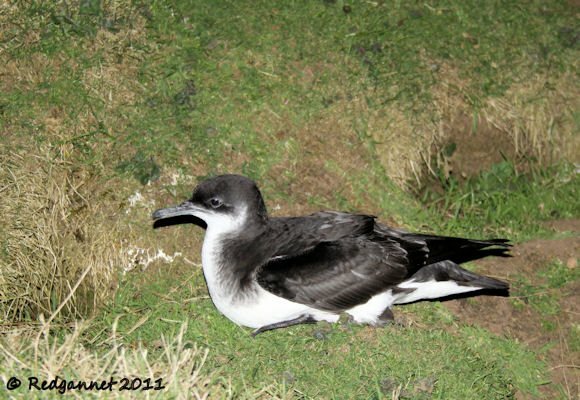 You have got to admire the Manx Shearwater. As a youngster of 10-weeks old, it is abandoned by its parents and left to fend for itself. Its first flight will take it from its burrow, usually on the west coast of the United Kingdom, to the coast of South America, an extraordinary journey for an unaccompanied minor. Setting out at night to avoid being caught by the large gulls, they can cover the 10,000 km journey in just two weeks. The world’s largest Manx Shearwater colony is on Skomer, an island off the south-west coast of Wales, UK. Each year 120,000 birds visit the island to breed from March through August in burrows that riddle the landscape. A pair of birds in a nesting burrow share the parental responsiblities and change shifts under the cover of darkness. Sadly the presence of such an easy food supply draws the predations of Greater Black-backed Gulls who catch them as they arrive and depart from their burrows. 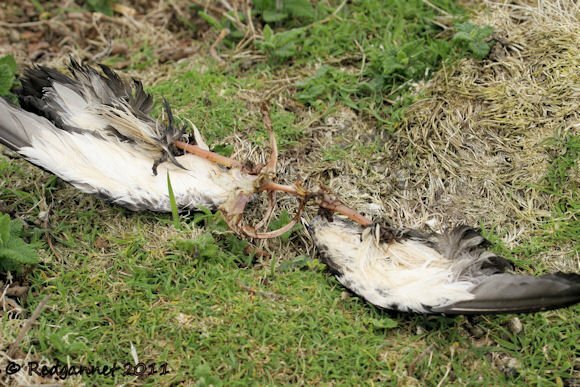 Shearwater remains litter the island with the carcasses picked clean, leaving just the wings, breastbone and girdle. A big moon gives enough light for the gulls to hunt by, so the shearwaters seldom come onto land while the full moon is up. 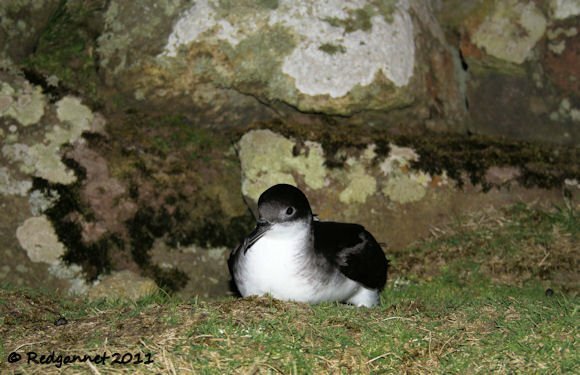 The shearwaters’ problem is having their legs set so far back on their body that they are inneffective on land, leaving the bird to stumble and topple amongst the entrances to the burrows and the mounds of spoil from the excavations. I was able to watch them through a night-vision system (choose your friends not for compatability, but for their gadgets) and they really are clumsy and incompetent on the uneven ground and vulnerable to attack by predators. They further add to their own demise by calling to each other. The vocalisation is an eerie 4 syllable cry that prompted legends, in the old days of lore and superstition, of the spirits of dead sailors, returning to Earth to torment the living. As one of the pair comes in to land, it calls with its own unique version of the 4-note phrase and is answered by its mate to enable it to find the burrow. The gulls are able to use the sounds to locate their stumbling prey. After mating, a single egg is laid and incubation duties are shared by both parents. While one bird sits, its mate feeds out at sea for a week or so. The long shifts before swapping duties reduce the number of times that the birds have to run the gauntlet of the gulls and increase their chances of succesfully raising the chick to the age of abandonment. The cross-overs become more frequent as the growing chick’s demands become greater and the birds are forced to feed close to the island and throng Cardigan Bay as summer progresses. 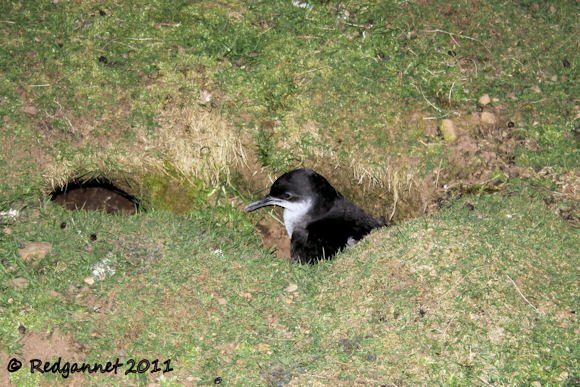 Manx Shearwaters often return to use the same burrow year after year and when young birds return to Skomer, they commonly make landfall very close to the burrow that they were born in. However, some will strike out on their own and colonies have become established on small remote islands off the east coast of USA, with some ringed birds from Skomer and Skokholm being recaptured there. By the end of August, the chick has grown larger than its parents with extra reserves of fat to fuel it on its long journey. The parents now desert the burrow and the chick, leaving it to the harsh realities of life beyond its sanctuary below the ground. It usually waits for a few days before taking the metaphorical plunge, but once it leaves the burrow and flies for the first time, it will not stop until it reaches the waters off Brazil and Argentina. Perhaps some one can tell me this; not only does it find the way from the UK to Brazil all by itself, how does it even know that it is supposed to fly? It has never seen its parents fly so what would possess an erstwhile subterrannean creature to make it suppose that flight was even an option? 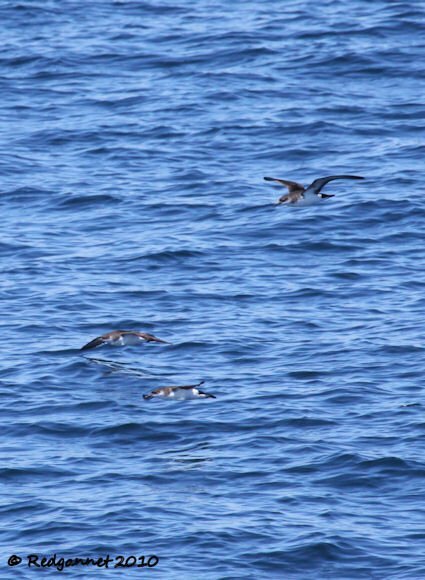 The navigating prowess of the Manx Shearwater was demonstrated in an experiment involving 2 birds that were removed from Skomer’s neighbouring island of Skokholm and taken to Boston, Massachussetts. From here, the one surviving bird was released and was able to find the way back to its burrow on Skokholm within a fortnight. 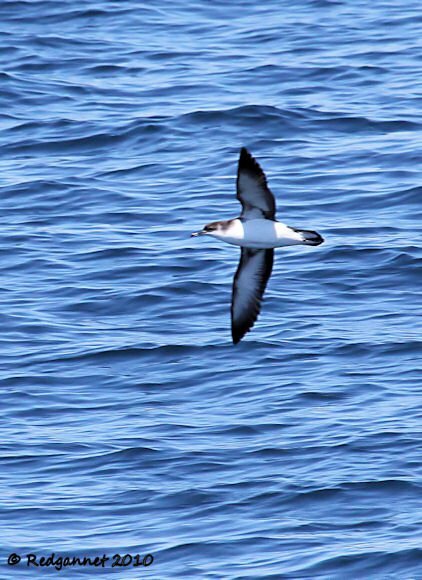 The shearwaters make good subjects for homing experiments. The sitting bird will be expecting to wait for several days before a change of shift and can extend that by a few more days without any hardships. The egg can stand a fair degree of chilling, so a single parent can afford to leave the burrow for sometime to feed without losing the egg if its partner does not return quickly. So if one bird of a pair is removed after the egg is laid, it is possible that the remaining bird will be able to take over full parental duties until the removed bird finds its way back. Photographs taken on Skomer were limited to one picture per bird. 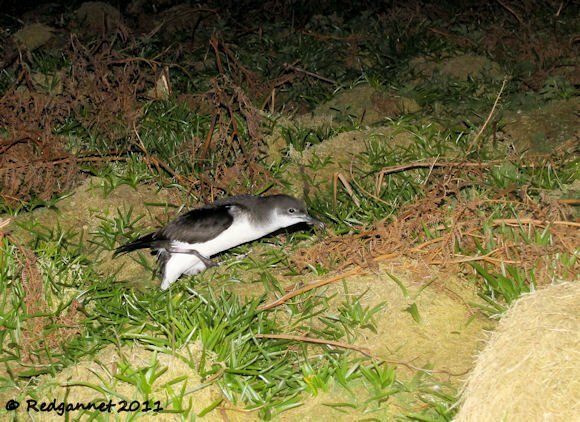 A recommendation by the conservation group that governs the island accepts that flash photography would not unduly disrupt the shearwaters’ behaviour, nor make it vulnerable, provided that no more than one flash fire is used on any bird. If you liked this post, why not check out the large and growing collection of galleries at 10,000 Clicks. For a trip report to the island of Skomer follow the link to the four-part trilogy at Redgannet. Where Are You Birding This Fourth Weekend of September 2018?